VATICAN CITY (CNS) — The percentage of Catholics practicing their faith is declining almost everywhere around the globe. Almost all bishops report it, but it’s difficult to prove statistically. Each year, the Vatican’s own statisticians compile mountains of data about the number of Catholics, baptisms, priests and religious, weddings and annulments in each diocese and country. The numbers illustrate trends over time, but many factors lead to the variations, said Enrico Nenna, the chief statistician in the Vatican’s Central Office for Church Statistics. He said in his parish “over the last five years there has been an amazing increased heterogeneity” with young and old, married and single, Italian and immigrant worshippers. The number of baptisms and Catholic weddings reported around the world also are influenced by too many factors to be unquestionable indications of Catholic practice, Nenna said. For example, the declining number of Catholic weddings worries the Church because it indicates, at least in part, that some Catholics are forgoing a sacramental marriage in favor of a civil union or are simply living together, he said. But it also reflects that people around the world are marrying older and, especially in a time of economic crisis, are waiting to start a family of their own. Similarly, he said, while a declining number of infant baptisms can indicate a weaker faith commitment among a generation of new Catholic parents, it also is a natural result of declining birthrates. The working document for the upcoming world Synod of Bishops on the new evangelization contains more than a dozen references to a “weakening of faith” or “declining practice,” but it includes no numbers. The document was written on the basis of the responses to a Vatican questionnaire submitted by 114 bishops’ conferences, 26 Vatican offices and the international unions of superior generals of religious orders. At the same time, the Vatican’s Statistical Yearbook of the Church reports that the number of Catholics in the world — almost 1.2 billion — continues to grow with the global population, holding steady at about 17.5 percent of the world’s people. The number of priests has shown a steady increase since 2000, and the number of seminarians has gone up each year for the past 15 years. For Nenna, the reports to the synod planners and the contents of the statistical yearbook are not necessarily at odds. The synod document is based on observation, while the yearbook is based on a census each bishop is required to fill out annually. One problem with the census, Nenna said, is that not every bishop is careful filling out the forms and, in most situations, Catholics who stop going to church do not formally leave, so they are still counted as members. Still, the statistician believes there are signs of declining religious practice in the data he collects. For example, figures on the number of first Communions and confirmations celebrated point to a decline, particularly in Europe, where Pope Benedict XVI and other Church leaders already have sounded the alarm. In the 20 years between 1990 and 2010, the global Catholic population grew from 928.5 million to almost 1.2 billion, a 29 percent increase. Europe was the only region reporting a drop in the number of Catholics and, according to the statistical yearbook, it was down less than 1 percent. However the 29 percent increase in Catholics worldwide is not mirrored in the number of first Communions or confirmations reported. The number of confirmations rose only 10 percent to 8.8 million in 2010, the yearbook says. The book’s breakdown by continent shows the number of confirmations was up everywhere except Europe, which reported a drop of 18 percent. And the situation is worse when looking at the breakdown of the 10.7 million first Communions reported. Over the past two decades, the number of first Communions dropped so much in the Americas, Oceania and Europe that it caused a decrease of 5 percent in the global numbers. 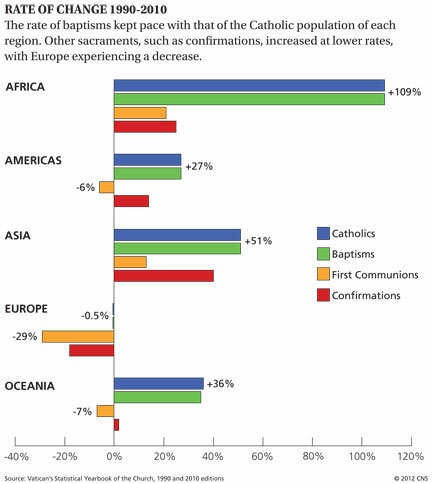 Even in Africa and Asia, where the number of first Communions increased over the past 20 years, the increase did not keep up with the rise in the total number of Catholics there. The Catholic population of Africa increased by 109 percent, but first Communions went up by only 21 percent; in Asia, the Catholic Church grew by more than 50 percent, while the number of first Communions reported increased 13 percent. The numbers could reflect a change in reporting methods — especially in places where many adults enter the Church and receive baptism, confirmation and first Communion at the same Mass — but they still demonstrate the bishops’ concerns have statistical weight behind them. The synod, which will bring representatives of all the world’s bishops’ conferences to the Vatican for three weeks in October, is designed to energize Catholic communities and find ways to reach out to those who, “despite being baptized, have drifted from the Church and Christian practice,” the synod working document says.